Down the back of our place, next to the chicken coop, is my studio. It’s really just a big shed with lots of cobwebs around the windows. But it is my favourite place in the world. 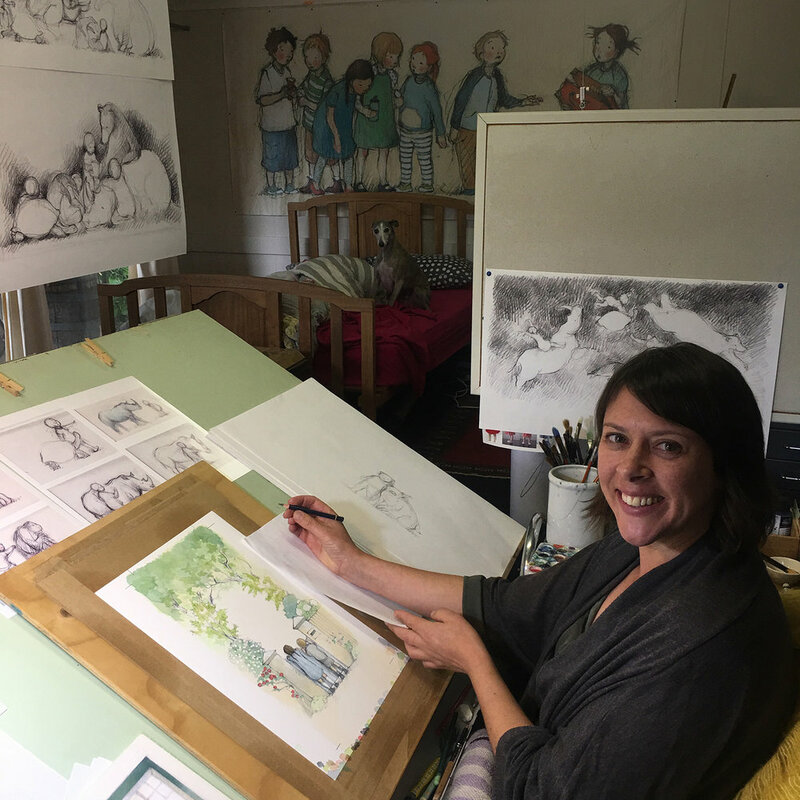 Inside my studio I have the extraordinary good fortune to work as a picture book illustrator, on books written by some of Australia’s best known authors including Libby Gleeson, Margaret Wild, Nick Bland, Jan Ormerod, Danny Parker and Mem Fox. Unsure of where in the world I belonged but always happy making things, I tried several jobs and hobbies before discovering illustration. Everything changed for me when I was offered the opportunity to illustrate a picture book called Two Summers. The story was written by John Heffernan and published by Scholastic Press in 2003. Ever since then I’ve been enjoying the amazing journey of learning all the ways you can illustrate a picture book. I’ve illustrated about 27 of them so far, but still feel like I’m only just starting. Along the way I’ve illustrated heart tingling books like Amy & Louis, written by Libby Gleeson, and adorable bedtime books like The Runaway Hug by Nick Bland. I’ve illustrated tear jerkers like Harry and Hopper, written by Margaret Wild and the recipient of the 2010 Kate Greenaway Medal, and timely/relevant stories like My Two Blankets, written by Irena Kobald, which won the CBCA Picture Book of the Year in 2015. And I’ve also tried my hand at illustrating my own stories such as The Great Rabbit Chase. I love the challenge of illustrating all these different picture books. My brilliant mess of my studio mid job. Feel free to write and say hello (via the CONTACT page), or follow me on Instagram or Facebook.